Armchair safari travelers have a new weapon at their fingertips—a real-time app tracking the migration of the wildebeest—and developers say it won't lead poachers to endangered prey in the same way that other geotagged images have. The HerdTracker, launched by safari operator Discover Africa, enriches a Google map with updates from pilots who fly over the Serengeti and Masai Mara, safari guides on the ground and rangers from the Tanzania National Parks Authority. "The two recent stories—'please do not take geotagged photos of our Rhino' photo shared by Eleni de Wet on Twitter (as featured on Gizmodo) along with the National Geographic story about the collared Bengal Tiger—highlight the need for keeping the whereabouts of rare and endangered animals discreet and are valid stories that need to be taken seriously, especially because they concern the geotagging of specific individual animals," Andre Van Kets, director of Discover Africa, said in an email to CNBC. Discover Africa opposes poaching and encourages people to disable geotagging on safari. "We believe 100 percent that HerdTracker does not pose a poaching risk to wildlife in the Serengeti," said Carel Verhoef, Discover Africa's east and central Africa travel expert with 10 years of Serengeti safari experience. "The common wildebeest (Connochaetes taurinus) which make up the majority of the migratory herds is not an endangered species," Verhoef said in an email to CNBC. It is listed by the 2000 IUCN Red List as "Lower Risk—Conservation Dependent" and on the African Wildlife Foundation "Least Threatened" list, and not on the list for CITES, the Convention on International Trade in Endangered Species of Wild Fauna and Flora. Wildebeest are not sought after by poachers and even the tracking of their herds is unlikely to expose other wildlife that interact with the herds, Verhoef said. "Lions and other predators are territorial creatures. They roam freely within their territorial areas and do not 'follow the herd' per se. There is no way that HerdTracker could ever reveal the location of lions or any other animals in a way that would be to the benefit of poachers," he said. "HerdTracker's GPS updates do not single out individual animals (as was the case of the Rhino and the Bengal Tiger). HerdTracker GPS updates plot the approximate position of the entire herd. Usually the epicentre of the largest herd, which can consist of hundreds of thousands of animals. 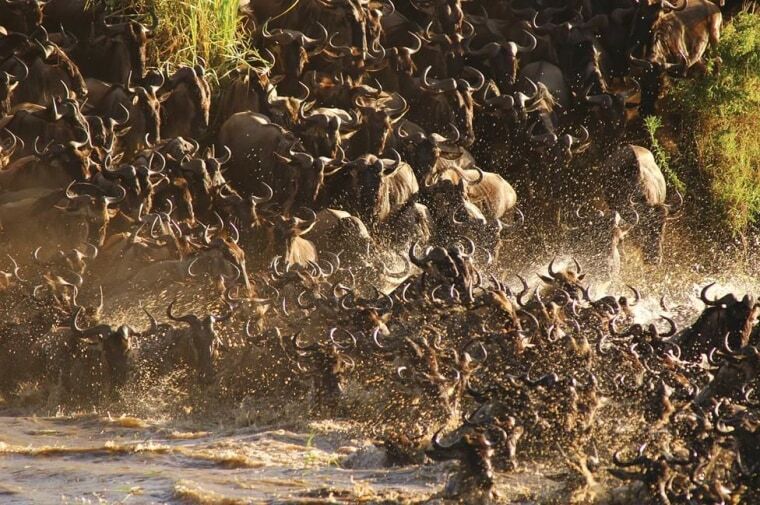 There are dozens of subherds that make-up the mega-herd that is the migration." But even if you can track the herd with an app, should you? "Technology is undeniably a vital and growing aspect of tourism all over the world. However it's been our experience that it's hard to beat the judgement and wisdom that comes from our safari guides tracking these herds by sight day after day, year after year," Michael D'Amico, whose Global Basecampspartners with safari leaders in Africa and elsewhere. "Also the experience as a whole is altered when geotracking is present, the thrill of the chase is no longer present," D'Amico said. "Thanks to the hundreds of highly trained experienced safari guides active in eastern Africa, the current location of the wildebeest migration is not exactly a day-to-day mystery."